I should have written this post ages ago (okay, at least before Christmas anyway) but time just got away from me. For that I must apologize to some really lovely people who thought enough of us here to present us with the Kreativ Blogger award. First, Roxy the Traveling Dog gave us the award and we were truly verklempt with the nice things she said about Bella and our blog. Then, probably because it took me so long to write this, Brando and Bogart and Pauley James Former Foster Baby gave us the award as well. I am really touched by their kindnesses. Doing some research about the award, I found it has evolved over time and the 'rules' are slightly different depending on the blogging community sharing it. It started in 2008 as a small and informal award given by Norwegian arts and crafts blogger, Hulda, to a few of her friends in recognition of their creativity. I think it's neat how this award has continued on and morphed into so many varieties. This time around, thankfully, the rules seem pretty simple: I have to share 10 things you don't know about us and then I get to pass the award on to 6 of my favorite blogs. Fetch is a foreign concept to Bella. She will, on occasion, chase after a thrown ball but generally just keeps running as opposed to picking up the object and returning it. I have hypothyroidism. So does Bella. Bella doesn't like toys that 'squeal' and 'scream' like real animals (see: Talking Pipsqueak and Flingshot Flying Animals). She whimpers and cries and delicately carries them around with her. We think she's 'worried' about it, which is strange because, well, see #6. I am an avocational musician. Or at least I was until Bella arrived. She's afraid of the guitar so I haven't played it, or any other instrument, in a few years. I do still sing and dance with her though. She remains unimpressed. Taking Bella's collar off used to send her into a state of panic. She got the collar when she came home from the shelter with us and, of course, had never worn one as a street dog in Puerto Rico. She apparently associates the collar with her family and her home. Over the years, we have had to make a point of taking it off occasionally and putting it back on to assure her we're not sending her back to Puerto Rico when it does come off. Bella and I have spent the last 3 years hiding in the basement during thunderstorms - she goes into an absolute panic during storms and leads me desperately to the basement door. Don't feel too bad for me, this is where our television set is and once we're down there, I turn on the TV to a nice quiet music station, Bella hops up on the couch beside me and goes to sleep. It's a small price to pay for her comfort - even if it is usually at 3 am. Chronicles of Cardigan - 'Chronicles' the adventures of Cardigan Welsh Corgis Dewi, Jon Farleigh and their scribe, Elizabeth. Seriously funny stuff that always makes me laugh. I also very much appreciate their efforts to promote pet adoption and shelter animals. CindyLu's Muse - CindyLu is the sweetest little Shih Tzu you'll ever meet. She and her hu-mom, Kim, host a blog full of information, funny stories, giveaways and other pet-related treats they find of interest. Tireless in their support of adoption and rescue, they also offer a weekly Fab Feline/Furry Friend Friday featuring animals in need of a home. Declan's Dogs Blog - Declan is a retired racing Greyhound who, per his profile enjoys eating, sleeping, walking, eating, sleeping and farting. And eating. He is a very silly boy and totally aware of his own awesomeness. Accompanied by fantastic photos, the blog also promotes adopting Greyhounds and has a great page of resources on where to adopt one in the UK. I Still Want More Puppies - Pup Fan, the blog author is an enormous fan of "pup and pop culture". She's also a freakin' riot! The blog features her pup, Bella (the first ;) as well as all sorts of entertaining original content. (Her Christmas "caroldies" were a highlight of the season). Sundays feature her "Adorable Adoptables" theme highlighting shelter animals looking for their forever homes. Life With Desmond - I have a soft spot in my heart for Desmond and his hu-mom, Lauren. Another slightly crazy rescue dog, I see so much of me and Bella in their often hilarious, always entertaining antics. Disillusioned with the overbearing, outdated training resources available to her, Lauren took matters into her own hands and is now training to be a trainer herself. Way to go, Lauren! I really would like to thank everyone for the warm welcome we've received from the pet blogging community. It has been both sweet and humbling. We always knew Bella was special. We're glad to find some of you think so, too. Thank you so much for sharing this award with me. I truly appreciate it and I really love reading your blog! Congrats! Nice to learn new things about you and Bella. Fred will bring a ball back, just won't let go! Our late Basset Barney was afraid of thunder storms, too. Congratulations on the award!! Taking off Finn's collar used to drive her crazy, but now she kind of likes it! Wow! Awarded by three separate bloggers? Is there a record on these things? You might have hit it! Cool award, too. Congratulations! Congratulations on your award and thank you for passing it on to us:) I didn't know ours was the first blog you followed, I'm honoured! And also very pleased that you've joined the club and are blogging your heart out as I love reading your blog, but have to confess to still not having caught up! I know everyone will thank me rather than curse me for initiating your blog addiction! It might be a few days before I pass on this award as I'm determined to catch up with reading more blogs than I've managed to so far. But the longer I leave it the easier it will be as more blogs will have been awarded it and I'll have less to choose from, lol. Thank you again, Leslie. I'm just sorry I can't pass the award on to you! Well, you just plain rock! :) Congrats to you and Bella, and THANK YOU for this honor. I am truly humbled. I can't get over Bella's collar quirk. Poor baby! She must be one razor sharp girl to even make that association, though. what a great post!! Cody is obsessed with smelling my breath too! He waits til after I have brushed my teeth and it is before bed. Since you know Dakota and may not know Cody, Cody is my cat lol. We ADORE Kim and CindyLu and we ADORE "Pup Fan" as well! We aren't familiar with the others that you mentioned so we will have to check them out. I love when the awards start moving along because I love learning about my favorite bloggers. I thought the thunderstorm story was fabulous. I'm so glad Bella has found a way to get some comfort during a storm. 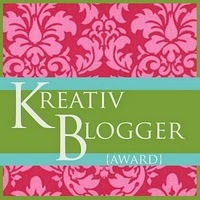 You picked some wonderfully kreativ bloggers to pass the award onto. They are my favorite too! Pauley is with Bella on the whole fetch thing. He will run like the dickens to make sure he beats the other dogs there, but then walks away. Our Ginger had a squeaking newspaper that she carried around for years & if anyone ever squeaked it, she would practically fall apart. We always called it her baby. Can't wait to check out the other blogs! No worries and no rush about getting a post up. I actually hesitated to send it to you because I know you're swamped with "real life" and didn't want this to feel like a burden. But I couldn't NOT give it to you so please don't feel pressured. It's just been such a pleasure getting to know you and your dogs. I was just happy you didn't already have it yet so I could pass the award on! You know I love your blog - you AND your dogs crack me up. There are so many good blogs out there it was hard to choose. I wish I could have listed a bunch more. I'm so new to these parts, every blog seems like a new discovery and I'm such a dog freak that I love following ALL their adventures. This award is nice, though, because it does offer the opportunity to learn something new about the bloggers and their pets. That's been fun to follow. Poor Ginger. We had to stop letting Bella play with these toys because they were upsetting her so much. I think they do feel some maternal sense for certain things. Congrats on your award! It was cool learning a bit about you and Bella. :-) Meadow and Leah are BOTH very jealous that Bella has a bomb shelter to go to when there are storms! Congratulations on the award! I love number 3 in your list! Happy new year to you and yours as well! I suspect a lot of people love the blogs on my list. And who doesn't love Deccy? He's such a scamp! thanks so much for this! i am super slow with these kinds of things, too. ok, ok. i am super slow with most things. there. i said it. Aw, congratulations on your award! Well deserved!